Headquartered in San Diego, and with offices in Amsterdam, Dubai, Hong Kong, London, New York, Paris, Rio de Janeiro, Singapore, and Tokyo, Kyriba serves more than 1000 clients worldwide. The company’s Proactive Treasury Management (PTM) approach delivers solutions and methodology for treasury departments to better anticipate and plan for market volatility, regulation, and fraud, as well as leverage opportunities for growth. By implementing Kyriba’s PTM, global organizations are better suited to manage their cash and liquidity, risk management and supply chain finance solutions. 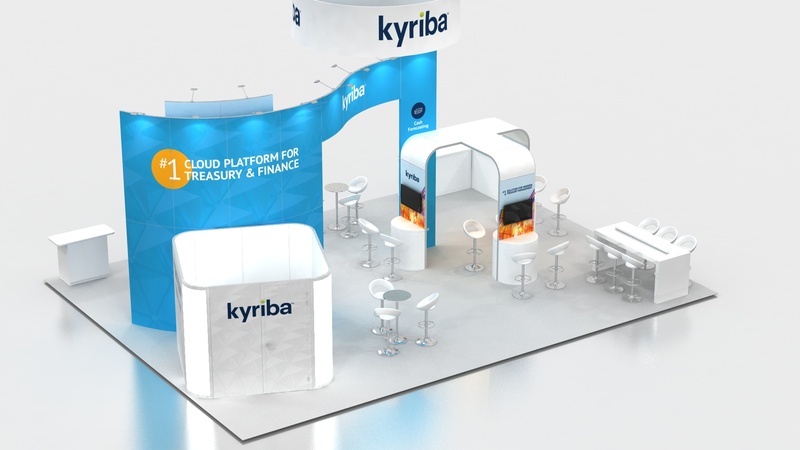 Kyriba, the global leader in cloud treasury management, has developed a deep understanding of the role and operational goals of the CFO, corporate treasurer and the finance team at the companies it serves. A big part of establishing and maintaining such relationships is the company’s presence at industry trade shows. As a result, Kyriba’s marketing team find themselves on the road quite a bit, attending more than 50 shows per year, 35 of which take place in North America. One of, if not the largest and most important annual conference for Kyriba is the Association for Financial Professionals (AFP) Annual Conference, which was held this year in Denver, Colorado. At AFP, hundreds of exhibitors jockey for position to meet with some of the over 6,500 treasury and finance professionals who, in turn, have come to the event hoping to find solutions to benefit their respective organizations in today’s more complex financial world. Even with the best and most innovative offerings, however, it can be a challenge to stand apart from the competition and catch the attention of potential customers and partners. 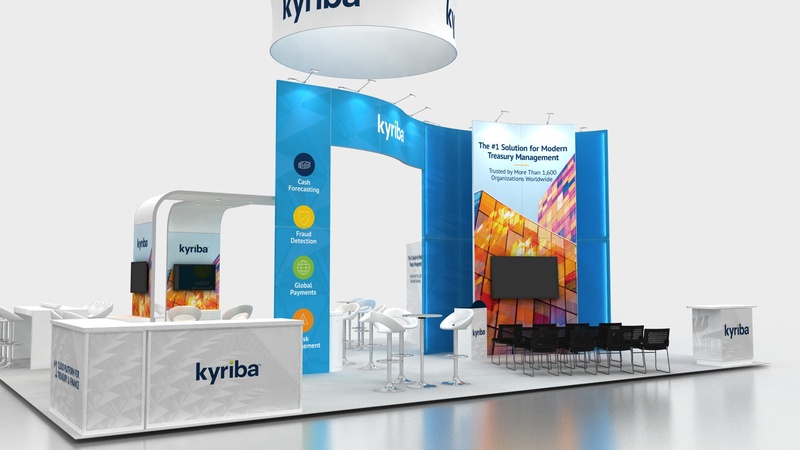 That’s where ExpoMarketing came in - partnering with Kyriba’s marketing team to design a booth that would attract event-goers while effectively representing the company’s brand and state-of-the-art technology. “Our main goal at AFP is to generate a large amount of meaningful traffic,” said Gretchen Vincent, events manager at Kyriba. “If we can have good conversations and get a large number of attendees to experience hands-on demos at our demo stations, then we consider the event a success,” she went on to say. "That’s where ExpoMarketing came in – partnering with Kyriba’s marketing team to design a booth that would attract event-goers..."
Kyriba’s booth also required a design that could smoothly serve multiple functions at AFP and other shows. The company has a particularly active presence at shows – performing live demos of its technology at 4 demo stations; holding meetings in a private space; and conducting live presentations before a comfortable seating area – often all at the same time! In order to set the stage for keeping all of these important activities running smoothly and to prevent the booth space from becoming chaotic, ExpoMarketing helped Kyriba establish an open, free-flowing 30x40 space that easily accommodated the company’s 25 plus attending employees while appearing inviting from all sides. Playing off of the fact that Kyriba’s SaaS technology can help its customers breathe easier, a “relaxation” theme was developed for the booth. Three of the four sides of the booth opened up to “walk-through” pathways making the activities inside the booth particularly inviting and accessible. The warm, welcoming environment was accentuated by design elements specifically focused on the relaxation theme, including a pleasing natural flow to the layout, a large and comfortable L-shaped couch, and even sleeping mask giveaways. This “oasis of calm” was much appreciated by the attendees of AFP’s bustling show floor. The end result was a resounding victory for Kyriba at this year’s AFP. Plus, the Kyriba team, who strive daily to provide peace of mind for their clients, appreciated the same treatment from ExpoMarketing. The trade show industry will present your company with a number of obstacles. We’ve seen some “interesting” issues arise and are able to anticipate the things that could make your experience less successful. Our team will help you with logistics management from show to show, print different graphics as your brand grows, and always make sure you are getting the most economical solution available. Designing a booth that meets your expectations is only a part of our overall goal — we also help you problem solve and have a great experience working with us from your first phone call and on to each trade show you exhibit at. Would you like to see other custom island exhibits that were brought to life?